It's hard work running a command post, but if young generals need to stay the night, there's plenty of room inside the Pacific Play Tents Hq Bed Tent - Twin Size. 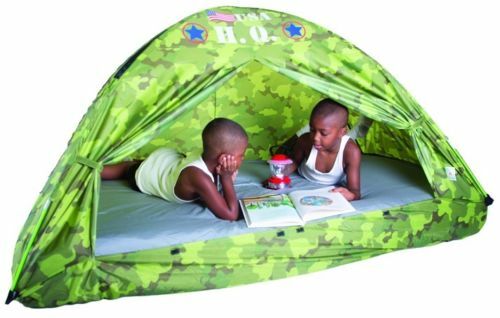 This portable, no-hassle tent has a body of camo-printed polyester with military-style logos and a design that's intended to fit a standard, twin-sized mattress. Tie-backs keep the door open and a durable floor of waterproof polyethylene protects them from moisture when they're outdoors and protects your floors from spills and accidents when they're indoors. Shock-corded, polyurethane-coated poles allow for easy and stable construction. This tent is flame-retardant and cleans with just a damp cloth. Dimensions 77L x 38W x 35H in.